The subfamily Danainae, often referred to by their collective English Common name of "Tigers and Crows" display aposematic colouration as a warning to predators that they are distasteful and should be avoided. 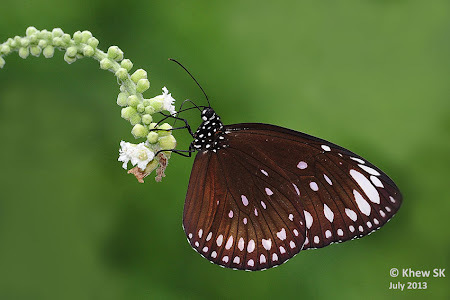 One such species, the Spotted Black Crow is predominantly black in colour, with typical white spots on its wings which is characteristic of several species of the Euploea genus. This Spotted Black Crow, shot last weekend, kept returning again and again to the flowers of the Stringbush to feed, even when disturbed. A moderately rare species, the Spotted Black Crow is often observed on the landward side of mangrove areas in Singapore. Its caterpillars feed on Apocynaceae plants which are lactiferous. It is the chemical compound in the host plant that gives the adult butterfly its distasteful properties.